Helps smooth out wrinkles (long-lasting effects). Easily absorbed by the body (significantly lower molecular weight). Hyaluronic acid (HA) is found in the space surrounding cells and is particularly concentrated in the synovial fluid which lubricates joints, as well as in cartilage, cardiac valves, inner ear fluid, the dermis, epidermis and vitreous humour of the eyes. The function of most of these tissues is cellular hydration and separation of environments. Forming an extra-cellular matrix, HA acts as a lubricant and shock-absorber, and transports nutrients into, and waste out of, cells. What makes HA ideal for these tasks is its unique structure and the large size of its polymers. As the body ages, it produces less and less HA and supplementation may therefore offer important benefits both in terms of longevity and quality of life. However, the large size of HA's molecules is also problematic - it makes it difficult to absorb when taken orally. That's why it has only been possible, until now, for HA to be used intravenously or topically. Once again it's Japan which has produced an essential innovation: a sophisticated technological process of enzymatic cleaving enabling supermolecules of HA to be split into low molecular weight polymers which are easily absorbed. Supplementation with HA Injuv® increases measurable markers of HA activity in the body and produces proven clinical effects. One particular study, involving 96 females aged 22-65, showed an extraordinary improvement in the hydration, softness and firmness of the skin, highlighting the huge potential of Injuv® as an internal' cosmetic! Another study showed that Injuv® helps restore joint mobility and relieves arthritic pain. These results are consistent with current understanding of the role of HA in the body. Logic and science have combined to make Injuv® a very promising supplement! Other ingredients: Yellow beeswax, rice bran oil. 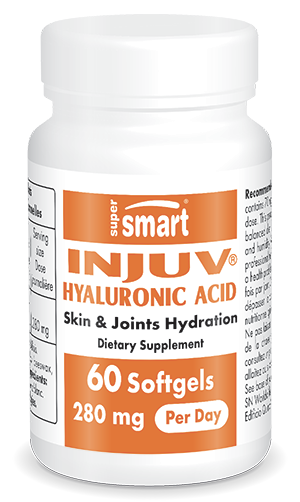 Each softgel contains 70 mg Injuv®.